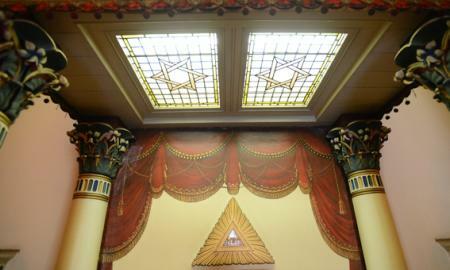 The Royal Arch Degree is the continuation of the story of the Temple as described in a Craft Lodge. The Degree is conferred in Royal Arch Chapters and any Master Mason of one (1) year’s good standing is entitled to become a Royal Arch Mason. While Royal Arch Masonry has its own governing body, it has long been regarded as an integral, even essential, part of of a Freemason’s journey. An Irish Freemason’s first encounter with a Royal Arch Chapter is in a Lodge of Mark Master Masons, where the Degree of Mark Master Mason is conferred. The newly made Mark Master Mason is then fully qualified to become a Royal Arch Mason. The Mark Master Mason Degree expands on the Masonic duties of fellowship and benevolence, while the Royal Arch Degree contains impressive symbolic content and continues the Legend contained in the Master Mason Degree. However, these should not be considered to be the fourth (4th) and fifth (5th) Degrees, but rather as separate Degrees that complement a Freemason’s knowledge.